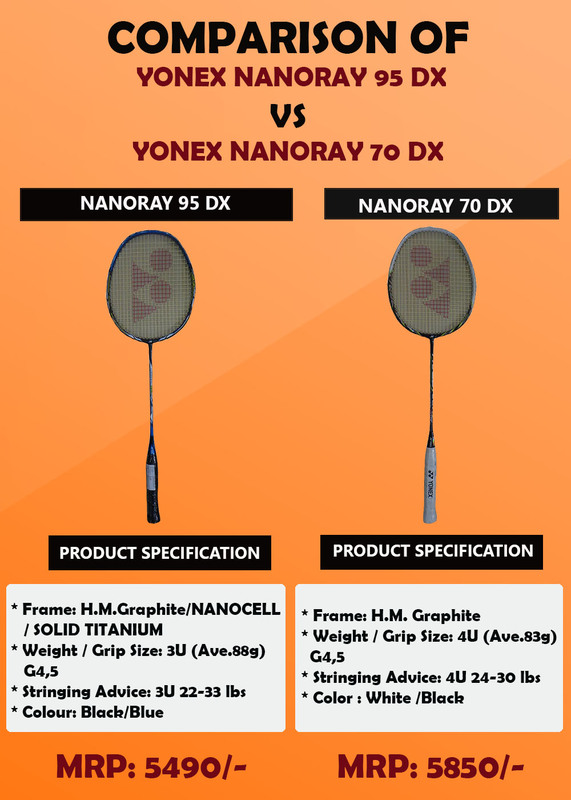 Comparison of Yonex Nanoray 95 Dx Vs Yonex Nanoray 70Dx | Khelmart.org | It's all about Sports. Both the rackets are belongs to Yonex Nanoray Head light series. We all know that head light series gives better repulsion and quick racket swing speed. Yonex Nanoray 95 Dx is made of Nanocell and Nanomesh + Carbon Nanotube material at racket frame.This gives flexibility to handle the string tension up to 33 LBS. So player who love to play with higher string tension will definitely like this racket. 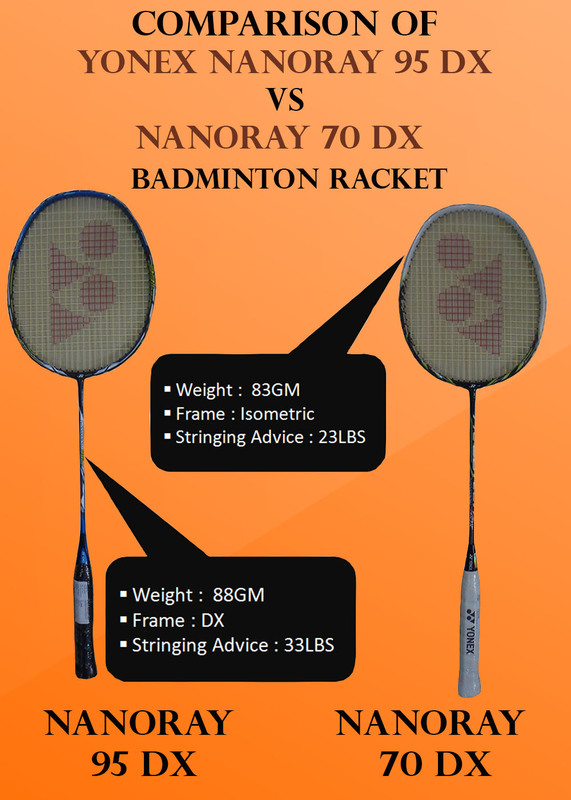 Yonex Nanoray 70 Dx is designed to handle string tension up to 27 Lbs. So string tension is difference in two. Nanoray 95 Dx is equipped with new racket material known as Nanocell. It is fine bubble shape fibers mix into main material which gives better impact strength. Nanoray 95 Dx frame is equipped with DX technology which is basically new concept of frame cross section. DX frame enables wider cross section at X direction which gives more strength to frame. 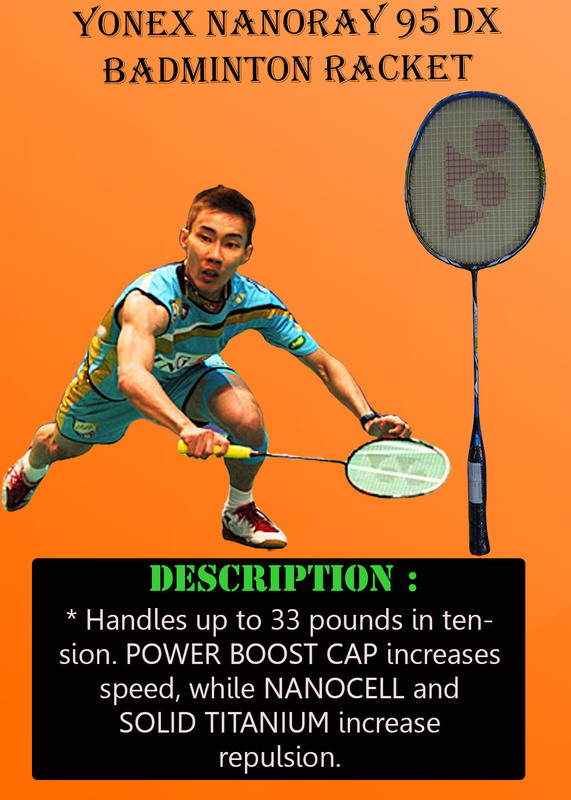 Nanoray 95 DX racket is equipped with POWER BOOST CAP which combines hard and soft materials to maximize the shaft’s bending power without losing stability. This Racket is developed by YONEX JAPAN for those players who want to play with extreme power and speed. Racket is strung with 33 Lbs. 33 lbs is now tangible with latest frame technology known as DX frame. With DX frame, players get more strength on racket frame which results into fast smashes from 95DX racket. It is head light racket designed with Nanoray frame which allow to hold the shuttle for longer time at string bed and offers great control on shots during intense badminton rallies.95 DX is made H.M.Graphite/NANOCELL/ SOLID TITANIUM which gives extra ordinary performance to racke while its shaft is made of H.M. Graphite/NANOMESH + CARBON NANOTUBE which delivers superb stiffness. Racket weight is 88 Gms while racket color is black and blue. This Racket is belongs to head light series which is designed to delivery fast racket handling with control on shuttle. Aero frame concept is used to design the frame which gives superb racket frame aerodynamics. Its frame material can withstand the strong string tension up to 33 LBS. Player who love to play with 28lbs; this new innovation will stun them. Racket is equipped with T Anchor which is a new material used at the T Joint of racket to make it more stable during fast badminton rallies. Yonex used new grommets pattern to racket frame with single pass grommets construction. This gives opportunities to add up more grommets holes. Nanoray 70DX is developed with DX frame technology. In DX frame technology, Yonex redesign the cross section of frame and make it wider at longitudinally and strengthen at lateral direction. 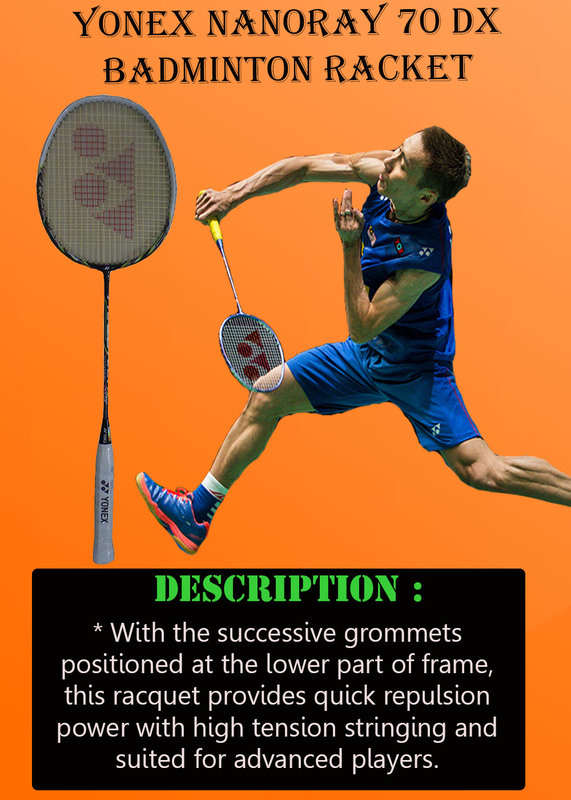 Redesigning of frame gives added bending strength and impact strength to racket frame. Its frame material can withstand the strong string tension up to 30 LBS. Player who love to play with higher string tension; this new innovation will stun them. 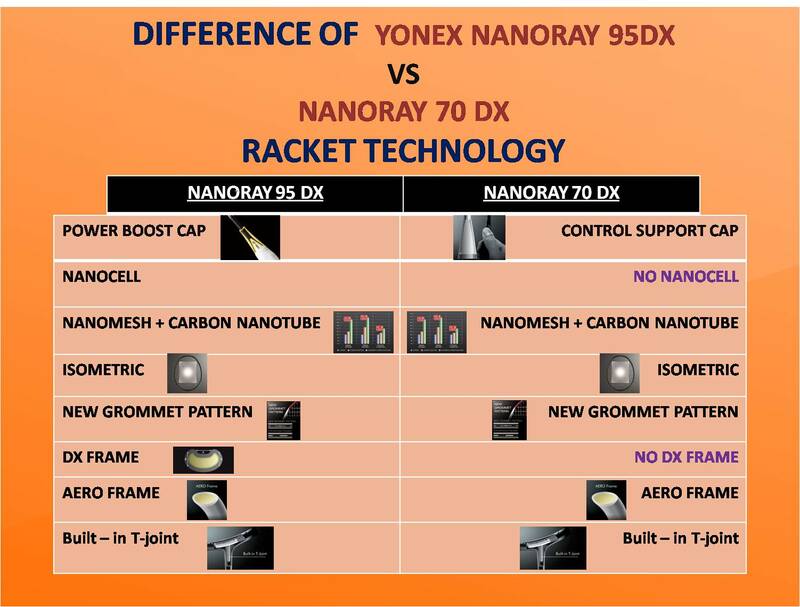 This entry was posted in Badminton and tagged Comparison of Yonex Nanoray 95 Dx Vs Yonex Nanoray 70Dx, Details of Comparison of Yonex Nanoray 95 Dx Vs Yonex Nanoray 70Dx, Images of Comparison of Yonex Nanoray 95 Dx Vs Yonex Nanoray 70Dx, Technology of Comparison of Yonex Nanoray 95 Dx Vs Yonex Nanoray 70Dx. Bookmark the permalink.